The world of work is changing — you can see it in the numbers. Freelancers who made up a mere 6% of the workforce in 1989 are expected to represent 43% of the workforce by 2020. Average length of unemployment extends. The average duration of unemployment in America has extended from 8.5 weeks in 1980, to 12 weeks in 2000, to 25.1 weeks today. Pension plans begin to become a thing of the past. The number of full-time workers at U.S. private sector firms enrolled in defined benefit pension plans has dropped from 60% in 1982 to a mere 14% today, equating to a decrease in retirement savings for many. Cost of living spikes while incomes deflate. The median family income fell 8% from 2000 to 2012. In contrast, during that same period, the average price of rent went up 13%. Automation threatens jobs. Reports suggest that recent developments in machine learning will put as much as 47% of American jobs at risk within the next two decades. Combining data gleaned from our LinkedIn ProFinder professionals* with that of our friends at Intuit** we’ve discovered how, in the face of these broader shifts, the on-demand economy is shaping a new generation of professional. 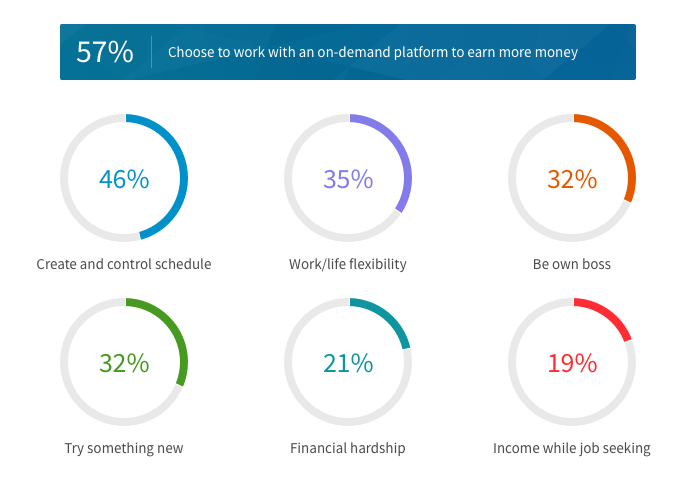 Given the economic uncertainties faced by many, it should come as no surprise that the top reason people choose to work with an on-demand platform is to earn more money (57%). In fact, 66% of gig workers report having highly variable incomes, so supplemental freelance work is enabling them to establish more consistency and stability in their finances. Other top motivators among professionals taking the leap in to gig work include work-life balance, the departure from a traditional 9-to-5 work schedule, and autonomy. On-demand platforms enable professionals to more quickly and easily supplement their traditional day jobs, shifting the “professional norm” in ways few could have predicted. Our data evidences this dynamic with 41% of on-demand workers having either a traditional full-time job (27%) or part-time job (14%), in addition to their on-demand work. Only 5% of on-demand workers work exclusively for a single gig provider. 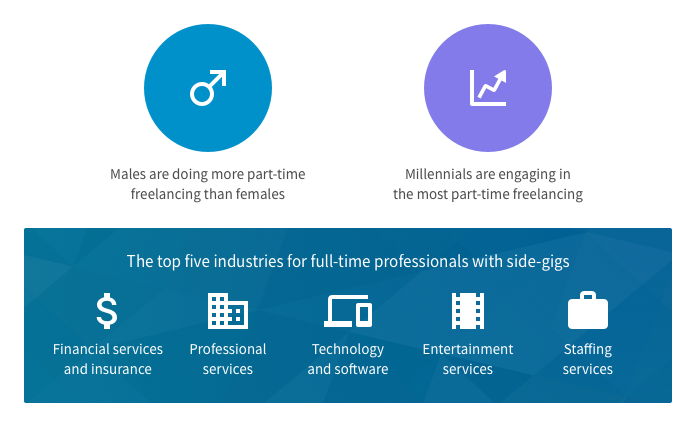 This further reinforces the growing trend of part-time freelancing we’ve been watching and reporting on over the past few quarters. We’re also happy to report that the extra income, improved work-life balance, and control over work and scheduling leads to a pretty satisfied workforce. In fact, 67% of on-demand professionals are Highly Satisfied or Satisfied with their work. The gig economy has taken hold and we can only expect this shift in the workforce to become more pronounced with time. Our data shows that 81% of on-demand workers plan to continue working in the gig economy. Of those, 47% plan to increase their freelance hours. Overall, it’s clear that freelancing is playing a remarkably positive role for modern workers. Whether these professionals are looking for supplemental income, control of their work-life balance, or projects that fuel their passions, the on-demand economy is enabling democratized access to these opportunities. And thus, a new generation of professional is taking shape among America’s workforce. ** The results of this analysis were obtained via a survey of 6,247 gig economy workers, completed between September 20th and November 18st, 2016. The survey respondents came from Intuit’s partner company provider lists including: Upwork, Wonolo, MBO Partners, OnForce, Work Market, Catalant, Field Nation, Amazon Mechanical Turk, Kelly Services, Lyft, Avvo and Task Rabbit.